Home English Article Tekno ASUS Motherboard Specifications Features "Dual Intelligent Processors"
ASUS Motherboard Specifications Features "Dual Intelligent Processors"
Specifications Motherboard ASUS X99-Deluxe - As we all know one stream of computer hardware components are increasingly competing for issuing various new variants. One such manufacturer is ASUS has released one of the most vital component in the computer that Motherboard ASUS X99-Deluxe. 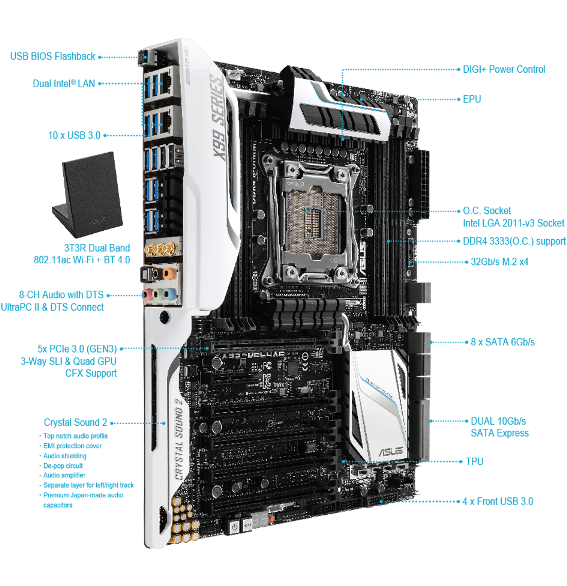 Motherboard ASUS X99-Deluxe is hardware intended for those who like games with high quality as well as for those of you who often do overclocking. For those of you who frequently perform overclocking, these motherboards provide features that are so attractive that the Dual Intelligent Processors are only one click you will get TPU, EPU, DIGI + Power Control, Fan Xpert 3, and Turbo App simultaneously. So it will get better CPU performance, the right and power savings can optimize the performance of the cooling system to work optimally. For more details about Motherboards X99-Deluxe can you check it out. Also Read : 3 Best Gaming Laptop from Asus. CPU : Intel Socket 2011 Core i7 Processor-v3, support Intel 22 nm CPU and Turbo Boost Technology. Memory : 8x DIMM, Max. 64GB DDR4, Support Intel Extreme Memory Profile (XMP). GPU : Support NVIDIA Quad-GPU SLI Technology, NVIDIA 3-Way SLI, AMD Quad-GPU CrossFireX and AMD 3-Way CrossFireX. Slots : 5 x PCIe 3.0 / 2.0 x16, 1 x PCIe 2.0 x4. LAN : Dual Slot LAN (Intel® I218V, 1 x Gigabit LAN Controller (s) and Intel I211-AT, 1 x Gigabit LAN). Wi-Fi : Wi-Fi 802.11a / b / g / n / ac (Supports dual frequency band 2.4 / 5 GHz, Support ASUS Wi-Fi Go! Utility and up to 1300Mbps speed transfer). Audio : Realtek ALC1150 8-Channel High Definition Audio Codec with features Crystal Sound 2. BIOS : Multi-Language BIOS, 128 MB Flash ROM. When you look from the detail specifications of ASUS motherboards can you make as a server, play games with high quality and also as one of the components of a home theater in your house because it has been equipped with Realtek ALC1150 8-Channel High Definition Audio CODEC. This is information Specifications Motherboads ASUS X99-Deluxe. May be useful for you and useful for us all.